Is it hard for your team to stay on top of issues? When it comes to helpdesk snafus, customer service glitches, or hitches with the new website, do you need to keep track of who’s working on which project, what’s been done so far, and whether the project is still hanging open? 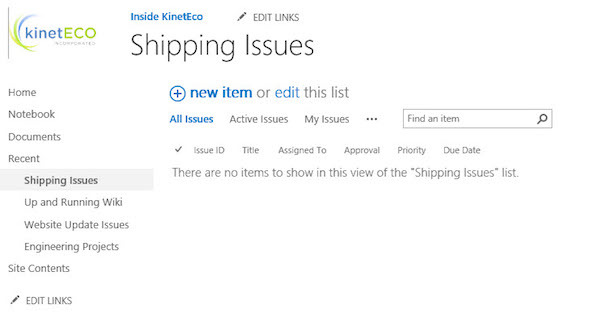 You might consider using the SharePoint Issue Tracking app. It can help you define and categorize issues, and wrangle them into a manageable heap with a systematic approach. The Issue Tracking app can be used for customer service problems, helpdesk incidents, website updates, new tools releases, project management hurdles, or any scenario with a stream of ongoing issues. It’s one of many List apps that come with SharePoint Server. I’m going to show you how to set up the Issue Tracking app—but you can learn more about adding List apps to your site and SharePoint in general by watching the free video Adding a list app to your sitefrom SharePoint Server 2013 Essential Training (if you’re using SharePoint Server 2013) or Adding a library or list app to your sitefrom SharePoint Online Essential Training (if you’re using SharePoint Online in Office 365). Issues have a Comments field for a running history. Capture what’s been done so far, such as troubleshooting steps, results, next steps, additional requests, and so on. The comments include a timestamp and the person’s name. For example, for a website update, Viola Barrios logs an issue about the title font size. Reggie updates the font, but then Sally Kerner would like to increase the font by one more point. The Comments section can capture all the input and actions along the way. You can categorize issues. This makes it easier to group, summarize, view, and report on issues. The list comes with placeholder categories that you customize and add to if needed. You can relate issues to each other. Tracking related issues can help you manage issues efficiently or identify trends. For example, in a Shipping Issues app, you might be tracking a software problem that caused a shipping glitch, but you might also want to track any individual customer service issues related to the problem. If your needs are fairly basic, you can create the Issue Tracking app in just a few minutes, update the categories and maybe a few more columns, and start inputting issues. If you have more complex needs, you can customize the app, such as with a custom column that tracks the number of days an issue is open. You can also add a workflow if you want to automate how issues are handled. 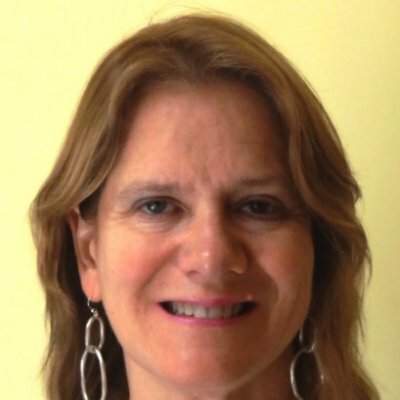 To learn more about workflows, check out the lynda.com course SharePoint Designer 2013: Custom Workflowswith Gini Courter. Let’s look at how to create a basic issue tracking app. These instructions apply to both SharePoint Server 2013 and SharePoint Online, and you can also find a similar issues list in SharePoint 2010. 1. Click Settings (gear icon), and then click Add an app. 2. Under Apps you can add, scroll down until you see Issue Tracking. Then click it. 3. 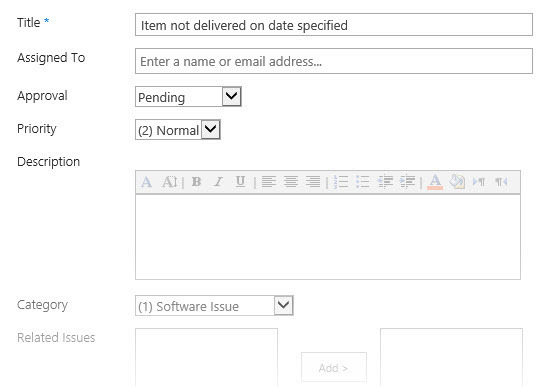 Under Adding Issue Tracking, type a name for your list, such as Shipping Issues. Then click Create. 4. Your new issue tracking app appears under Lists, Libraries, and Other Apps. Click the name of your new app to open it. The basic structure has been created, but you’ll want to update at least one of its columns before you use it. 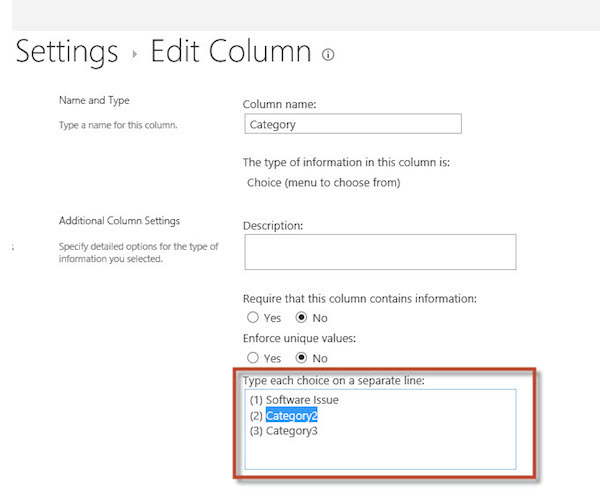 5. Review and change any columns you want by clicking on List in the ribbon,and then clicking List Settings. 6. One column you’ll want to customize is categories, since it just comes with placeholders, ie Category 1, Category 2, etc. Just select the placeholders and type over them with the names you want. You’re not locked into three categories; you can delete one or add more. 7. Click OK to save changes to the Category column. You may also want to review the Priority and Approval columns, as well as others, to make sure they suit your needs. You may want to fill out a sample issue or two to make sure no more tweaks are needed before your team starts filling out the list. Once you’ve finished customizing columns and making any other changes you want, then the list is ready to fill out. Just click New Item, and then fill in the information for each issue. Now you’re ready to start taming issues. Want to learn more helpful technical tricks? Check out these popular IT courses.Which Do You Need?